The Valley Forge Tourism & Convention Board is making it easy for you to plan your summer getaway to Montgomery County, PA! Our #MakeItMontco Hotel Package does the planning for you, with incredible deals on the best restaurants, entertainment, and attractions, including discounts to see Cirque du Soleil’s VOLTA under the Big Top at the Greater Philadelphia Expo Center at Oaks. Some moments are remembered forever. Experience Patriot Trails, our new Revolutionary War history tours. Follow in the footsteps of George Washington on these web-based itineraries that take you on a journey from Valley Forge National Historical Park to historic sites throughout Montgomery County. With over 200 arts attractions, Montgomery County is an arts destination! Montco is home to museums and galleries, a vibrant performing arts scene with live music, award-winning playhouses, and historic movie theaters, and some of the finest gardens and arboretums in the country. This summer, Cirque du Soleil’s VOLTA will #MakeItMontco under the Big Top on the grounds of the Greater Philadelphia Expo Center at Oaks. The show opens July 12. Below are 2018 Wawa Welcome America events in Valley Forge and Montgomery County. Check back for 2019 events! Wednesday, July 4 | 11:00 a.m. – 4:00 p.m. 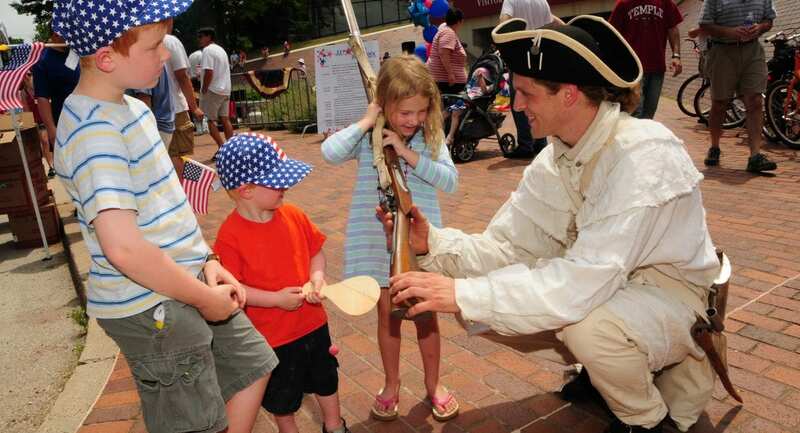 Celebrate our Nation’s independence with blackpowder demonstrations, historical games, an All-American cook-out, music, and more! Meet one of the founding fathers and sign the Declaration of Independence. Learn about the birth of the nation and the pivotal role the Valley Forge Encampment played in securing our freedom from Great Britain.